After a new film and video game generation was revealed, reports have surfaced about a Pokemon shoe collection, and Adidas might have something to do with it. Pokemon has enjoyed a big year of announcements, and it looks like there’s more on the way. Over on Instagram, fans were treated to a first-look at the reported Pokemon shoe collection. A well-known shoe profiler @hugokickz showcased two shoes from the line, and they have fans going nuts. The two shoes see focus on Pikachu and Squirtle. They are both casual sneakers with low-profile tops, and they have a white body. The classic look is remixed with some cute print Pokemon as the pocket monsters are printed all over the shoe’s body. The illustrations are all sorts of adorable, and the white leather kicks feature colored patches of each feature Pokemon. The shoes’ tongues feature a branding deal that shouts out Adidas and Pokemon. The red-and-yellow logo will have Pokemon purists feeling nostalgic, and the shoe’s body completes its look with Adidas’ traditional three-stripe design. According to Sole Collector, Adidas “has refused to comment on the potential collaboration” for the time being. No official announcement about this mash-up has been given by the brand or The Pokemon Company, but fans are hoping the brand will drop in time to celebrate Detective Pikachu this summer. While this Pokemon collection is still in limbo, Adidas has done shoes for other anime projects. Last year, the shoe brand got otakus hyped when it began to roll out their Dragon Ball Z line. Sneakers were released for characters like Goku, Gohan, Majin Buu, and more. 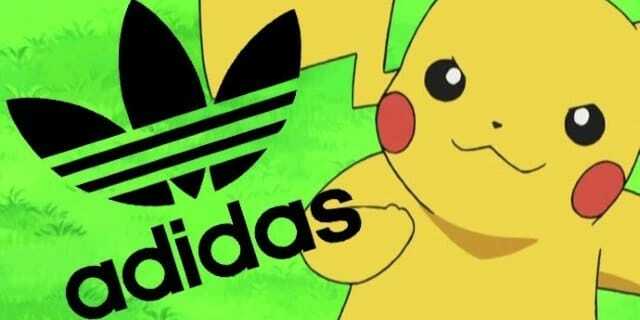 So, it’s not too surprising to hear Pokemon may be coming up as Adidas’ next collaboration.